056. SCOUT MARR, Issued by Godfrey Phillips Ltd. (1924). Card number 13 from a set of 25 entitled "Famous Boys". Size: Ca. 2.5" x 1.5". 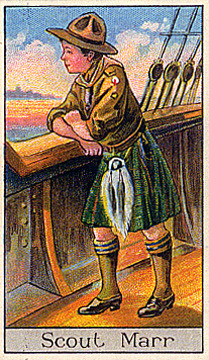 Recto: View of Marr in kilt leaning on rail of ship. At bottom: Scout Marr. Verso: No. 13 | FAMOUS BOYS | SERIES OF 25 | J.W.S. Marr, 1st Aberdeen Troop, accompanied Sir Ernest Shackleton, C.V.C., on the SS. Quest to chart the mainland of the Antarctic and to discover certain lost islands in the Pacific Ocean. Patrol Leader Marr has a fine record of seven years' service. He had been awarded the Royal Humane Society's bronze medal for life-saving, the Silver Cross of the Boy Scouts' Association for the same gallant deed, and the Gold Watch for gallantry presented by the Carnegie Trustees. He is, of course, a keen Scout, and of very fine physique, | ISSUED BY | GODFREY PHILLIPS LTD. | 112 Commercial St. London. E.